Are you a beer drinker? Do you think you will become one someday? If so, or if you want to learn more about the beer culture, today's jigsaw puzzle of the day might just be the right thing for you. Made by Piatnik, with a finished size of 26.5" x 17.4", it has as many as 1000 pieces, so you'd better get some six packs ready so sample while you're assembling it. It will not only make the puzzling more fun, but you will also be able to taste and enjoy some of the different beers featured in the image at the same time you're assembling their bottles. Needless to say, a beer bottle stands for more than just beer. It stands for a recipe, sometimes even for a history, but also for a unique taste, flavour and colour. A Leffe is nothing like a Carlsberg and a Carlsberg is nothing like a Stella Artois. And don’t even try to compare those two to a Corona or worse, a Guinness. You might be accused of sacrilege by some. The different beer bottles in this puzzle have different styles, different histories, and a sociological imagination would ascribe them different social communities. There are certainly Guinness drinkers that distinguish themselves from Carlsberg drinkers, and Corona drinkers that have nothing in common with the first two. Puzzle Warehouse, the largest jigsaw puzzle store in the world, supports your quest for knowledge and your passions by offering you this beer puzzle at an attractive price. Don't miss this opportunity to learn new things about beer types and beer bottles. 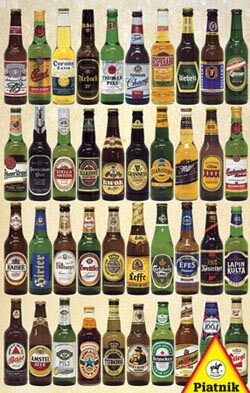 You might even find it useful one day, when you'll be able to impress your friends by recognizing different brands of beer only by looking at the bottles.